With LIME, steptext dance project offers choreographers and dance theorists, as well as students of choreography and performance studies, a platform for exchange about their own aesthetic experiences and dramaturgical strategies in contemporary dance. In 5-day labs, three prominent leading duos will open spaces for interdisciplinary work processes, by providing insight into their spe- cific artistic approaches, methods and experiences. With an additional program of performances, LIME, which is incorporated within the project Korespon- Dance Europe and in cooperation with Tanzplan Bremen, offers a variety of reference points for individual artistic growth and fertile exchange. The workshop language is English l The number of participants is limited. 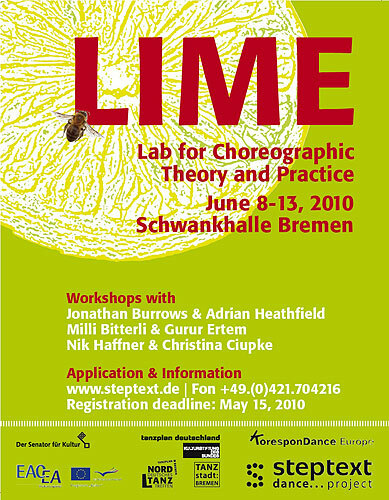 The 175,- EUR fee for the lab also includes a daily training and lunch, as well as tickets for all LIME performances. rooms starting at 20,- EUR can be arranged for participants.